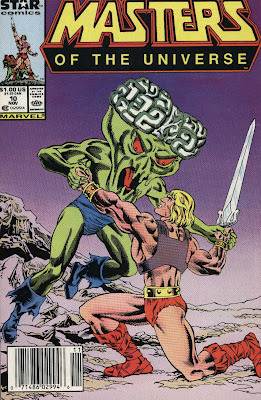 Masters of the Universe #10, “Courage,” is written by George Caragonne and illustrated by Alan Kupperberg and Danny Bulanadi. Here, Man-At-Arms is disabled by Skeletor’s henchmen, and Prince Adam and Teela go in search of a remedy. There are only two real complaints with the writing. First, a number of scenes, most notably those featuring the Mind Beast, are rushed; sometimes the comic doesn’t flow well at all, which can be confusing and frustrating. Second, it’s really hard to believe that the Sorceress couldn’t discern either imposter. This story also highlights precisely how there’s no good reason whatsoever for Adam not to tell Teela his identity, but obviously that isn’t Caragonne’s call to make. There is a horrendous error in this comic for which the buck must stop with the editor. On pages 2, 3, and 4, the Heroic Warriors are attacked by Saurod and Blade. On page 5, they’ve suddenly become Kobra Kahn and Webstor, respectively, in both the text and the art. Clearly these pages were redone at the last minute to include movie characters with new action figures, but somebody really messed up with page 5. Aside from the henchmen editing fiasco in the first few pages and the relatively minor plot issues, this is easily the best Star comic yet – this is the kind of character development we’ve been waiting for.